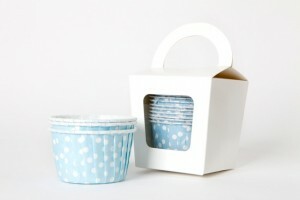 These lovely little blue polka dot candy cups are perfect for children’s birthday parties. You can bake cupcake or muffins in them or serve sweets or snacks in them. Great for icecream or for a lolly buffet. 12 cups in a white gift box.